Archaeologists claim to have found the site of the lost kingdom of Rheged, the most elusive of all the sixth century kingdoms of Dark Age Britain. Archaeologists may have finally found the lost kingdom of Rheged, the most elusive of all the sixth century kingdoms of Dark Age Britain. The mysterious kingdom was pre-eminent in northern Britain in the sixth century, but faded into obscurity after it was deliberately destroyed in the beginning of the following century. Historians had speculated that the kingdom was headquartered in Cumbria, a county in north west England, but no evidence of it was ever found. Then digs carried in 2012 at Trusty's Hill, which overlooks the Fleet valley in Galloway in south-west Scotland, revealed clues of the presence of a royal stronghold. "Our excavation revealed all the hallmarks of an early medieval royal site," Ronan Toolis at GUARD Archaeology in Glasgow, told Seeker. The discovery is detailed in a new book, "The Lost Dark Age Kingdom of Rheged," which is being released Saturday. Toolis and co-author Christopher Bowles found that in the decades around 600 A.D. the summit of the hill was fortified with a timber-laced stone rampart. They also recovered remains of supplementary defenses and enclosures along the lower-lying slopes, revealing that Trusty's Hill was fortified. "This is a type of fort that has been recognized in Scotland as a form of high status secular settlement of the early medieval period," Toolis said. "The evidence makes a compelling case for Galloway being the core of the kingdom of Rheged." Little is known about Rheged. Fragments of early medieval historical records and medieval poetry indicate the kingdom was particularly powerful under the warrior king Urien, whose prowess was celebrated by his court-bard Taliesin. Toolis and Bowles discovered that anyone approaching the summit of the hill passed through a symbolic entrance way defined by Pictish carvings on one side and a large rock-cut basin on the other. The Picts were a tribal group of people who lived in what is today eastern and northern Scotland during the Late Iron Age and Early Medieval periods. "It was a rite of passage where early medieval kings were perhaps anointed and ceremonies performed," Toolis said. He noted the entrance way bears a close resemblance to one found some 180 miles north at Dunadd hillfort, the royal center for the kings of Dalriada in what is now Argyll and Bute. There, an entrance way with Pictish carving and a rock-cut basin was also found. The king's hall may have stood at the highest part of Trusty's Hill on the west side. 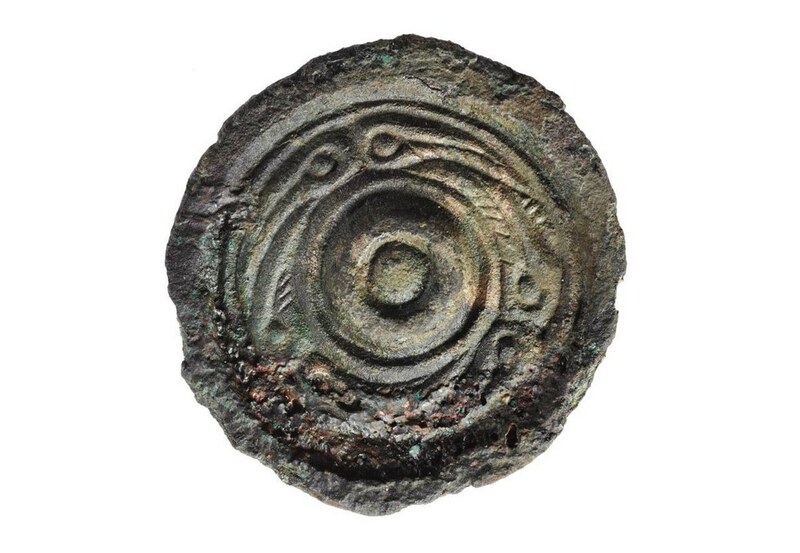 On the slightly lower area on the eastern side, the archaeologists found a workshop that produced metalwork of gold, silver, bronze and iron. The team also unearthed e-ware, a type of pottery imported from continental Europe, which indicates the royal household was part of a trade network that linked western Britain with Ireland and continental Europe. Other activities at Rheged included the spinning of wool, preparation of leather and feasting. A laser scan image of the carved Pictish symbols. "The household's wealth relied on their control of farming, animal husbandry and the management of local natural resources — minerals and timber — from an estate probably spanning the wider landscape of the Fleet valley and estuary," Christopher Bowles, Scottish borders council archaeologist, said. "Control was maintained by bonding the people of this land and the districts beyond to the royal household, by gifts, promises of protection and the bounties of raiding and warfare," he added. 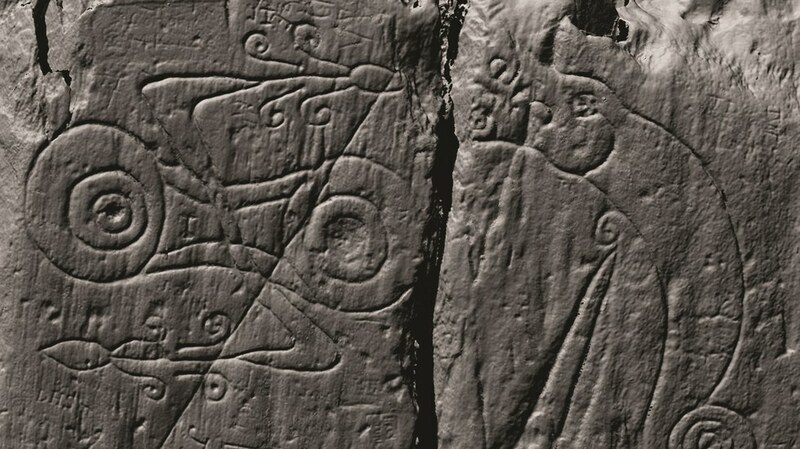 Analysis of the Pictish stone carvings revealed the symbols cannot be deciphered. "The literal meaning of the symbols at Trusty's Hill will probably never be known. There is no Pictish Rosetta Stone," Toolis said. The kingdom of Rheged was deliberately destroyed in the early seventh century AD. The site suffered such a sustained burning that the timber-laced stone rampart was melted and fused together. Researchers estimate that flames raged there for weeks or even months. "The deliberate and spectacular destruction of Trusty's Hills is a visceral reminder that the demise of this kingdom in the early seventh century AD came with sword and flame," the researchers said.